Mort Kunstler Limited Edition Christmas Print: "Janie Corbin and Old Jack (Christmas 1862)"
Image Size: 11" x 9 "
About the Art: It was a side of mighty "Stonewall" Jackson known only to a few. For a fleeting time in 1863, Jackson's inner heart was revealed to all who were in his presence. In the winter of 1862-63, Jackson made his headquarters at Moss Neck Plantation on Virginia's Rappahannock River. The plantation was owned by Richard and Roberta Corbin, who had a young daughter named Janie, known for her friendly, delightful personality. While visiting with Janie's parents, Jackson and the child developed an endearing friendship - encouraged, perhaps, by the fact that Jackson had a newly-born daughter he had not yet seen or by the barren conditions of Jackson's own childhood. "Jackson oversaw the writing of battle reports," writes Dr. James I. Robertson, Jr. in Gods and Generals: The Paintings of Mort K�nstler, "took the lead in promoting religious activity inside his corps, and became almost an adopted father to five-year-old Corbin. The child visited Jackson's office daily. In the attention he gave her was the love and yearning he felt for the infant daughter he had not yet seen." Jackson willingly put aside his duties whenever Janie appeared at his headquarters. He laughed and played with the child - much to the surprise of officers and troops who knew only the formal, professional demeanor of "Stonewall" Jackson. Little Janie's visit became the daily routine that brightened the famous warrior's days. In March, when the looming spring campaign drew Jackson and his troops away from Moss Neck, he paid a farewell call on his five-year-old friend, only to learn that she was stricken with scarlet fever. He was reassured by her mother, who cited the doctor's predictions for a rapid recovery. A day later, news reached Jackson in the field that Janie Corbin had suddenly died. "Stonewall" Jackson, the hardened soldier, broke down and wept openly for the loss of his little friend. His tender emotions may have surprised some of his staff, but those who knew Jackson well understood the gentle spirit and tender heart that were usually concealed by the mighty man of war. 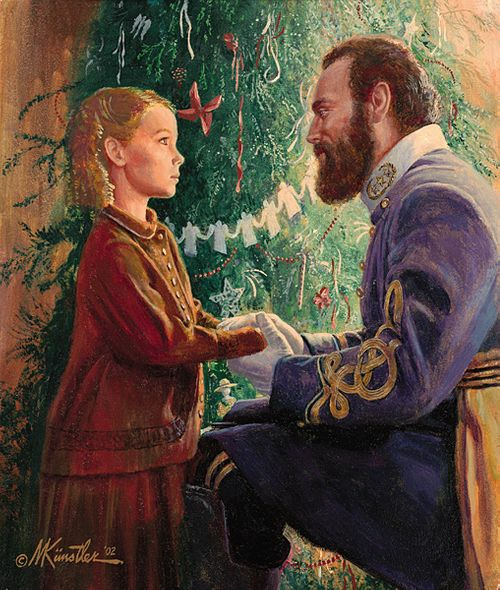 Within weeks, Jackson too would be gone - a casualty of his wounds at Chancellorsville - yet the story of Jackson's tender, cheerful moments with delightful little Janie Corbin would remain as enduring evidence of "Stonewall" Jackson, the man. Long ago, when I first read about "Stonewall" Jackson and his playful time with little Janie Corbin, I wanted to paint it. Jackson befriended the child when he made his headquarters at Moss Neck Plantation, which was owned by Janie's parents. It was the winter of 1862-63, following the battle of Fredericksburg, and Jackson, who was a new father himself, quickly became enamored with the little girl. The stern disciplinarian was often seen romping and playing piggy-back and other games with little Janie. Once he removed the gold braiding from his forage cap to give her as a tie for her hair. Christmas trees were becoming popular at this point in history and I thought it would make a perfect background for the painting. The ornaments of the day are authentically rendered, and I think the Christmas setting underscores the obvious love that Jackson showed for his little friend.